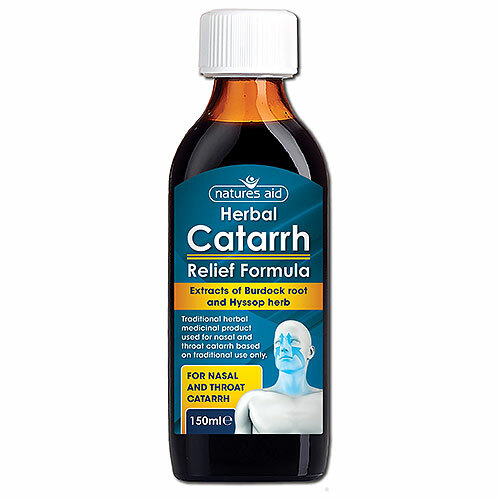 Natures Aid Catarrh Relief Formula is a Traditional Herbal medicinal product used to relieve the symptoms of nasal catarrh and catarrh of the throat. Based on traditional use only. Per 5 ml of syrup: Liquid extract burdock root (Arctium lappa L.) 0.25 ml, liquid extract hyssop herb (Hyssopus officinalis L.) 0.35ml. Additional Ingredients: ethanol, methyl parahydroxybenzoate (E218), propyl parahydroxybenzoate, tincture capsicum (containing capsicum oleoresin, ethanol and purified water), caramel (E150), glycerol (E422), viscarin SD389 (containing dextrose and carageenan (E407)), menthol, sodium saccharin (E954) and purified water. Take one 5ml spoonful 3 times a day. marigolds, daisies or artichokes; or any other ingredient listed. Are taking any other medicines known to interact with alcohol e.g. metronidazole. Also contains methyl parahydroxybenzoate (E218) which may cause allergic reactions (possibly delayed). have an intolerance to some sugars, contact your doctor before taking this product. Contains 11.5 vol% ethanol (alcohol). 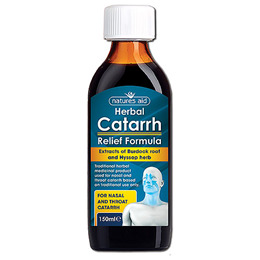 Below are reviews of Natures Aid Herbal Catarrh Relief Formula - 150ml by bodykind customers. If you have tried this product we'd love to hear what you think so please leave a review.